All plants release oxygen through photosynthesis, but some special species may have built-in air-filtering systems, too. A famous 1989 NASA study found that several common houseplants may actually remove carcinogenic chemicals like benzene and formaldehyde from the air in a controlled lab setting. 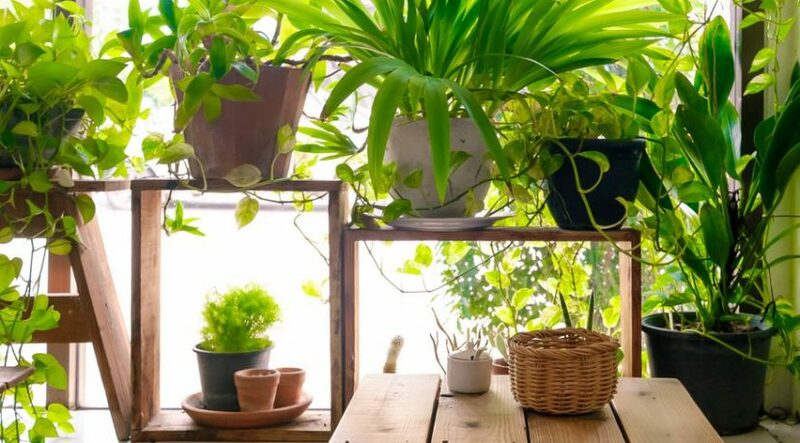 While subsequent research found inconclusive results about their effectiveness in actual homes, some scientists and gardeners believe having more plants around can also reduce stress and boost your mood. Either way, there’s no denying the fact your living room could use a little spruce-up. Here are seven top picks for creating your indoor garden. Ferns removed more formaldehyde from the air than any other plant in a 2010 studyfrom the American Society of Horticultural Science. The downside to these plants is that they can be finicky. You need to feed them weekly in seasons when they’re growing, monthly during the winter, and just regularly in general. Depending on the humidity and moisture levels in your home, you may need to water them or mist their leaves daily. The bamboo palm and lady palm also get cited as good choices for air quality. Contrary to instincts, palm trees like cooler temperatures — preferably in the 60 to 75 degrees Fahrenheit range. If you’ve got a dim office that’s just screaming for a little bit of nature, try a rubber plant or Janet Craig. Both will tolerate very little sun — although they may grow more slowly. Janet Craigs can tolerate more abuse and neglect than rubber trees, but rubber trees look a little more aesthetically pleasing. Thanks to its ability to climb structures, English ivy is easy to grow as topiary and use as a decorative element in your living spaces. It likes part sun and part shade, so it’s a good plant to try indoors that isn’t as temperamental as Boston ferns. Occasional watering and moisting during the winter will keep it healthy. One of the few houseplants that will bloom indoors, the peace lily with its seashell-shaped spathes really will bring a touch of summer into a dreary winter. It also prefers low-light conditions and has a high transpiration rate that will humidify your air — perfect for the office. Just be aware that the leaves can be toxic to pets and children.